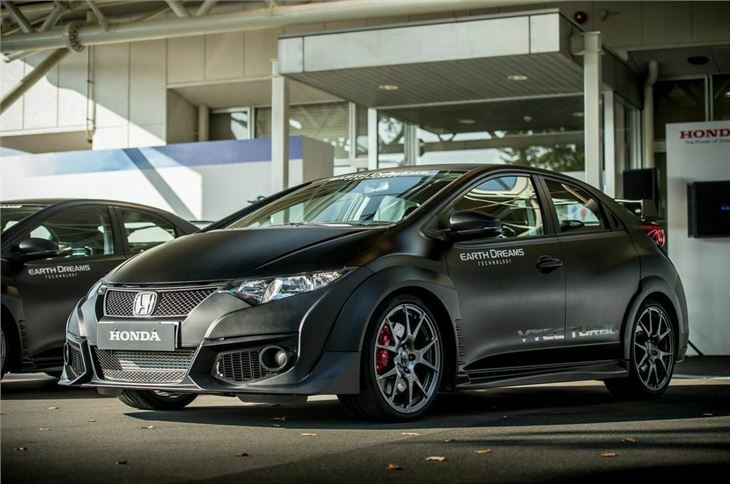 Honda is chasing the Nurburgring lap record for front-wheel-drive cars with its 2015 Civic Type R, which was announced just over a month ago at the Frankfurt Show (writes Rover Stansfield from Japan). 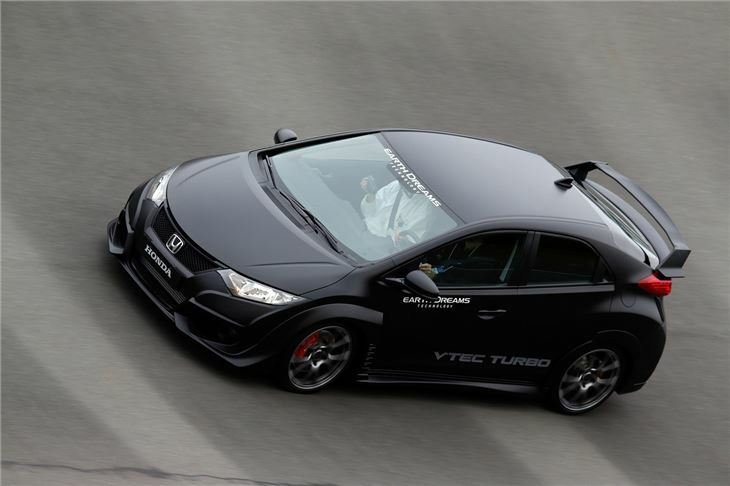 It has also revealed more details of the car and even given us a teaser first drive at its Tochigi test track in Japan. The shock news at Frankfurt was that the car will have a 2.0-litre direct-injection turbo engine in place of the high-revving normally aspirated unit that gave previous versions their unique character. Not only that, but a company which has always resisted getting into power struggles with other hot hatch makers had done a U-turn. The new car will have ‘at least 280 PS – 40 per cent more than ever before. Honda has now revealed that the torque of the new engine is more than double that of the predecessor – up from 195Nm to 400Nm, and at much lower revs. So the new car will accelerate faster than the previous one, and with direct-injection and turbocharging it should also use less fuel and emit less CO2. Honda has target performance and emissions figures, but isn’t yet saying what they when the car is not due to be released until mid-2015. Why so long? Because production has been held back so that Honda can bring the Civic Tourer to market first, next year. That makes estimating pricing tricky, although we’d something in excess of £26,000. 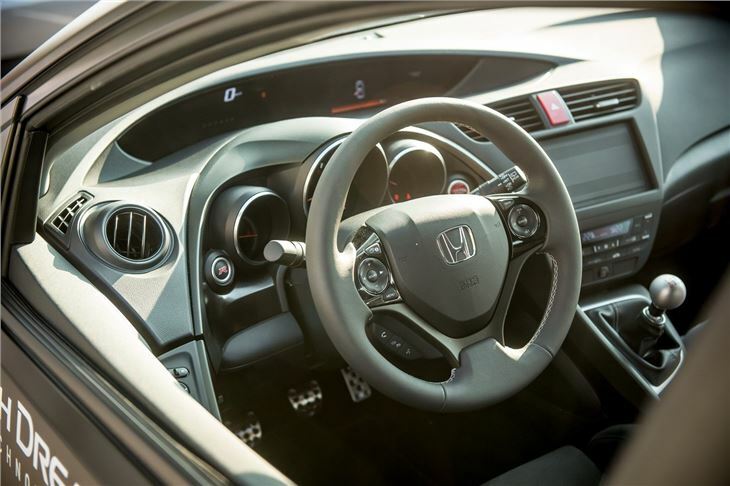 The new engine completely changes the way the Type R drives. It’s much stronger in the middle of the rev band – the old car needed revving ‘til it screamed before it really got going – which should make driving in traffic much easier. It can make the front tyres squirm under hard acceleration, but otherwise it steers and stops well and feels stable at speed. But it doesn’t make the same addictive noises when extended, although it sounds pleasing enough. The appearance of the new car is as much of a shock as the change of engine. A car that was always relatively sober-looking has sprouted big front wheel-arch extensions, an elaborate rear wing and, on the car we drove, 19-inch wheels and a matt-black livery. Honda has also announced Honda the introduction of three all-new VTEC TURBO engines as part of its growing Earth Dreams Technology range. These new engines come in three capacities; 1 litre, 1.5 litre and 2 litre, and will deliver a dynamic performance, as well as class-leading output and fuel economy. All three engines will be direct-injection petrol turbos, utilising variable valve motion technology such as Honda’s refined VTEC technology. Together with Honda’s 1.6 litre diesel engine and hybrid technology, these new turbo engines will be applied on a number of future global models, depending on local market requirements and vehicle characteristics. Based on a completely new engine structure and utilising its newly developed turbo systems, Honda has downsized its engines and produced a highly efficient 1 litre direct-injection, 3-cyclinder turbo engine as well as a 1.5 litre direct injection, 4-cyclinder turbo engine. Both engines have low friction throughout and are able to achieve class-leading output and environmental performance. 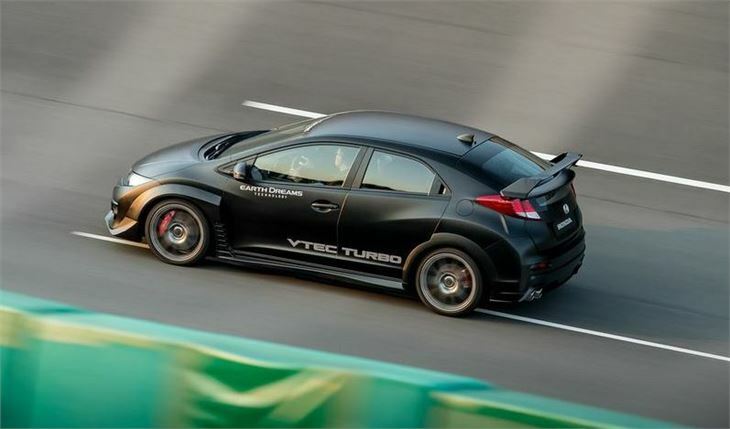 The first VTEC TURBO set to come to Europe will be the high-output 2 litre, direct injection, 4-cyclinder turbo engine, which will appear in the forthcoming Civic Type R. A highly efficient and highly responsive engine, it will have an output in excess of 280ps and will be EURO 6 compliant.